Two weeks ago on T-Shirt Talk, we wrote an op-ed piece called, “Does Partnering with GAP Diminish Threadless’ Cool Factor?” which covered Threadless‘ recent partnership with GAP. In the article, we addressed a range of concerns, such as the nature of the partnership, artist royalties, and brand continuity. We wanted to tie all the loose questions and concerns together that we had found on blogs, forums, and Threadless community comments into one cohesive article that presented the partnership from all angles – the good, and the (potential) bad. Of course, we jumped at the opportunity to talk to Jake, both as the founder of Threadless to answer our questions, and as an ambitious entrepreneur who might just be able to teach us a thing or two about running your own business, satisfying a community, and learning how to accept and integrate partnerships. We gave Jake a ring from our quaint, naturally lit office last week on a rainy Wednesday afternoon – after some “Can you hear me now?” we finally got to talking. T-Shirt Talk: Thanks for taking the time to talk to us, Jake! Did you read our article? TST: Yes – we were glad that your blog post followed our article so closely – good timing! To start things off, we wanted to focus in on partnerships. 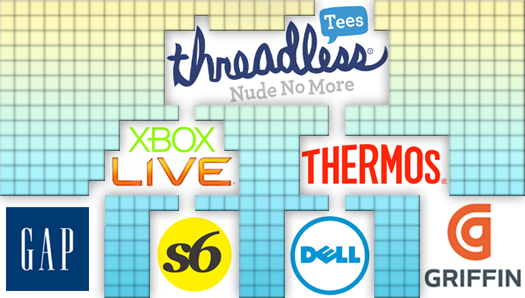 How has Threadless handled the partnership process? What was it like at first, as opposed to now? JN: At first, we weren’t really seeking out partnerships, since we were doing everything ourselves. Once Threadless got moving, we started to get too many partnership requests. It was hard to develop a good vetting process, let alone handle the inbound requests. Partnerships are really something that we’ve been trying to figure out since we started the “Loves” campaign – our first series of “real” partnerships. When we launched Loves, the design community loved it! They were happy to design something for someone else, like a band, or for the chance to win something awesome, like a trip. As we kept growing, we started to gain more exciting partnerships – they just seemed to land on our doorstep every single day. TST: So most early partners came to you first? TST: When did you start making larger partnerships? JN: We first got approached by a company (which was far larger than GAP, actually) in 2004 – it took us 8 years to figure out how to make something of that scale work. GAP is really our first “big retail” partnership. When it finally all came together, it made perfect sense, though. TST: What was the biggest concern from the community about partnering with a corporation the size of GAP? JN: Honestly, I thought there would be a bigger backlash – the most negative feedback that we’ve been getting from consumers and the community has been something along the lines of, “GAP clothes are made in sweatshops!” which as we all know is a decade old PR issue Gap had that they have long since rectified. GAP’s Threadless tees are made by us in factories we’ve approved. GAP pays us wholesale for Threadless shirts – we manufacture them, not GAP. We have a manufacturing partner in the Dominican Republic, which we visit regularly to make sure that everything meets our ethical standards. TST: Have there been concerns about partnerships degrading the continuity of the Threadless brand? One of our main answers for partnering with large distributors is variety – we’ve always tried to use variety with Threadless by itself, but there is only so far that we can go. TST: You’re saying big partnerships are really an extension of the existing “curated crowd-sourcing” model – a way to provide more channels for the wide variety of art you’re getting from a growing community? JN: Yes, that’s really why we wanted to explore partnerships in the first place – to filter different styles of art to their corresponding demographics, and interests into their correct markets. Consumers don’t want to see the same things everywhere. Threadless consumers, for example, want to see “Threadless style” art on t-shirts on our website. Retail consumers, however, might want to see something a bit different on an iPhone case, or a thermos. GAP consumers are going to want to see something a little less “avant-garde,” something more relatable to the simplicity of GAP. Of course, in the end, the artists want their artwork everywhere possible. Partnerships have always been about the artists – and so far, they have been 100% positive about all of it. We presented GAP about 100 designs for the first run of shirts – we notified all the designers, and not a single one said no. GAP ended up using 26 of those designs for the first offering, and we’re reviewing designs for the next offering now. 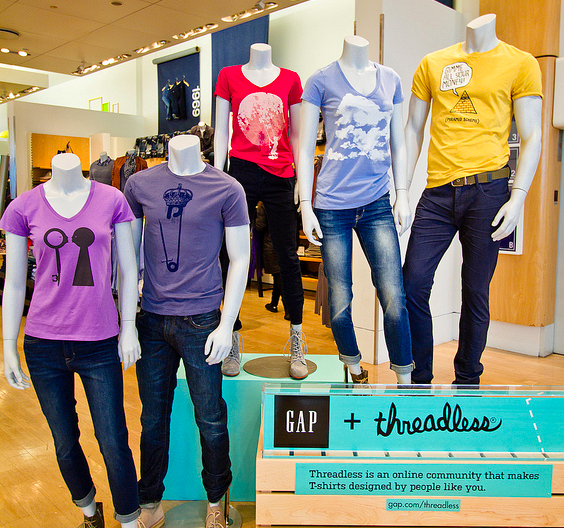 TST: How often can we expect rotation of Threadless offerings inside GAP? JN: We’re not completely solid about how many shirts and how often yet – we’ve talked to GAP about weekly / monthly rotation, but it’s hard for a big retailer to change stock that often. TST: Since only a small percentage of designs get selected and distributed at a time, how is Threadless making it worth it for artists? JN: I want Threadless to have a serious impact on the way art is consumed – we want to give credit to the artists, and tell stories about where the art and the artist come from. You know, Lego was doing something cool where you could submit lego models and get featured on the back of the packaging – we thought this was a really novel idea, personalizing products to the artists, instead of just the brands. Sometimes the artist’s story gets lost in the marketing – the brand stories, the advertising fabrications that surround the reality of the thing, which is that an artist, not a brand, spent time and energy into producing it in the first place. Threadless’ goal is to make sure that every artist, both online and at retail, gets their personal story told and receives unique exposure and promotion. TST: There has been concern that the “flat prize” for getting your design selected isn’t fair or sensible in every situation – has Threadless considered a more robust royalty system for artists to receive compensation? JN: Yes. We’re working on a royalty system right now, the only challenge we have to overcome is that we don’t yet have the tech infrastructure for it. We understand that sometimes royalties will return a greater profit to artists, whereas other times a flat prize makes more sense – in the end, we want to be able to offer both methods for different situations. For instance, a thermos sold at Target might seem like it would be huge for everyone – however, the individual profits end up being pretty small when you split up the percentages. This is an example of where you would want to offer a flat prize as opposed to royalties. Financially, any partnership gets complicated with a third hand in the pot – everybody’s gotta get paid. TST: You’ve really offered a lot of insight into your partnerships and how you are keeping your community happy. Thanks for answering all of our questions! We don’t want to take up your whole afternoon, but before we let you, we just wanted to ask you two more questions. JN: Of course. I’ve got a lunch coming up soon, so good timing. TST: We’ve heard that Threadless is getting into Print on Demand – how is this integral to Threadless as a business, and how does it fit into the vision / mission of the company? JN: We never want to be a Zazzle or a Cafepress. Threadless will always have a strong level of curation and community involvement – so long as the quality of the actual products is the same, POD makes business sense. With our POD, the quality is 100%. Additionally, one of the reasons we looked at POD in the first place was international distribution – we realized that if we can utilize POD, we don’t have to have duplicative inventory all over the place. Besides, T-Shirt warehouses are expensive, and bad for the environment. TST: Smart! Speaking of smarts, we have one more question for you: As someone who didn’t finish college themselves, do you think that experience is more valuable than education? JN: If you’re going to be a doctor, you should probably go to college. As an entrepreneur or artist – you should go the experience route. I have a friend who is using a variety of internships to build what he is calling his “personal MBA program” – for the next year, he’s going to be interning at different companies for a month at a time in leadership and executive positions, and learn about business by spending a year doing that. Instead of paying for college tuition, he just has to pay for his living expenses – which compared to college are much cheaper. Myself, I was working full time in my sophomore year of college when I started Threadless – I dropped out in my junior year to do freelance web consulting with my company, SkinnyCorp. It still took another 4 years before Threadless started making money. Looking back at my life, from going to school full time and then winding down to part time, I realized that I was learning skills that I wanted to have, but then using them for something completely different than I intended. When i started Threadless, my project at SkinnyCorp was to build an commerce website for dvd’s (deepdiscount.com, which I think is still up and running). The client got charged $250,000 for this site, and I was the sole developer. So, I ended up making $45,000 in a short 3 months. That’s how i made the jump to freelance work – which, then, made me realize that I could sell anything that I wanted online, and profit from that. At the time, I was a part of this international forum for design called Dreamless.org. I posted a thread on the forum, which basically said “Post your artwork in this thread and I’ll make things out of it.” I printed about two dozen shirts at first – then, I decided to start Threadless. In fact, the name Threadless is a reference the original thread I posted on Dreamless, asking people for their artwork. TST: Thank you for the inspirational illustrations – they really show how you can “think for yourself.” You’ve really given us some great insights today – Jake, thank you so much for your time. JN: You’re welcome – thank you! It is most definitely the little changes which will make the most important changes.